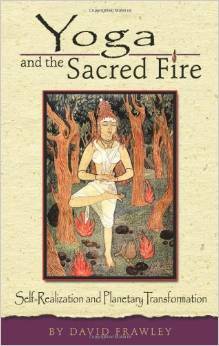 YOGA AND THE SACRED FIRE explores the evolution of life and consciousness according to the cosmology and psychology of Fire, viewing Fire not only as a material but also as a spiritual principle. It shows how Yoga’s deeper fire wisdom can help us move forward to an enlightened planetary age, where humanity and nature can again be one in a higher awareness. It is a breakthrough book in new thinking about Yoga for the current global crisis, showing the ecological basis and future of yoga. Considered to be David Frawley’s most thoughtful and innovative book. It takes not only the origins of Yoga but of world civilization back to the ancient fire wisdom and universal religion of light, through which we can once more reclaim our true role in life to promote the unfoldment of consciousness for the benefit of all. Excerpts from the book occured in Self-Realization Fellowship magazine. Required reference for our Advanced Yoga and Ayurveda course and recommended for all those wanting to understand the basis of David Frawley’s writings.